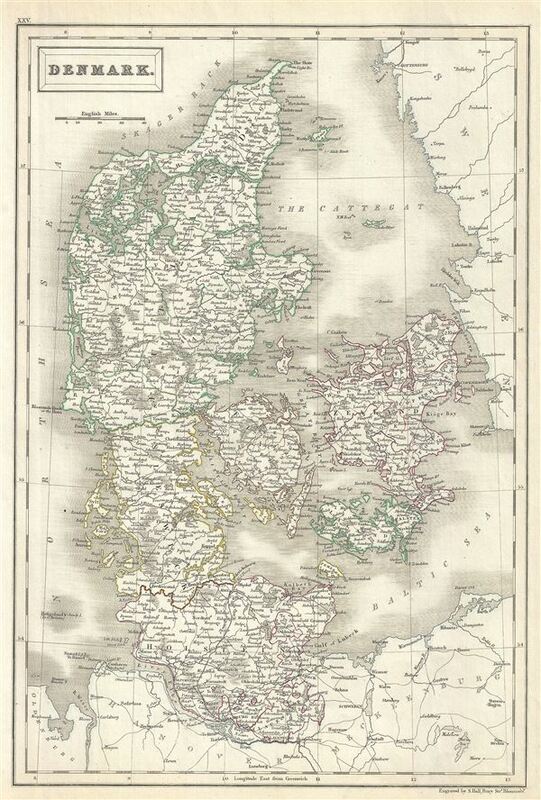 This is an attractive example of Adam and Charles Black's 1844 map of Denmark. It covers all of Denmark inclusive of the Duchy of Holstein. Various towns, rivers, cities and several other topographical details are noted. The Kattegat (Cattegat) is also identified. In 1848, four years after this map was made, Denmark would witness the First Schleswig War between Prussia, Germany and the duchies of Holstein and Schleswig against the Kingdom of Denmark. In 1848, when the king of Denmark, Frederick VII, proposed that the Duchies of Schleswig and Holstein be formally recognized as part of the Danish Kingdom, the predominantly German population of the two duchies rebelled for a free constitution, resulting in war. Denmark ultimately won the war and retained control of Schleswig-Holstein. This map was engraved by Sidney Hall and issued as plate no. XXV in the 1844 edition of Black's General Atlas. Rumsey 2305.031 (1854 edition). Philips (atlases) 4334.